← Follow me on Bloglovin’? Considering I got my sewing machine in 2007, the first non-vintage sewing pattern(s) I ever bought was the Perfect Pattern Parcel #1 earlier this year. Previously, I was loathe to spend the money for two main reasons; firstly, because the few vintage patterns I’d got from charity shops had ended up unfinished due to fitting issues, and secondly because I naively thought I could draft out whatever pattern I wanted myself and have it fit perfectly. (I think a lot of my early sewing was spent stitch-ripping and sewing in my underwear as I trial-and-errored my way through projects). When I read about the Perfect Pattern Parcel, I decided maybe I shouldn’t be so prejudiced against every sewing pattern ever drafted. Even if my mistrust of patterns was validated, part of the money was going to charity and I’d have to get some good karma back for that, right? I decided to start with the Ava dress by Victory Patterns (and now you understand the post title, non-sewing friends! ), thinking it could be a possible dress to wear to my best friend’s wedding. 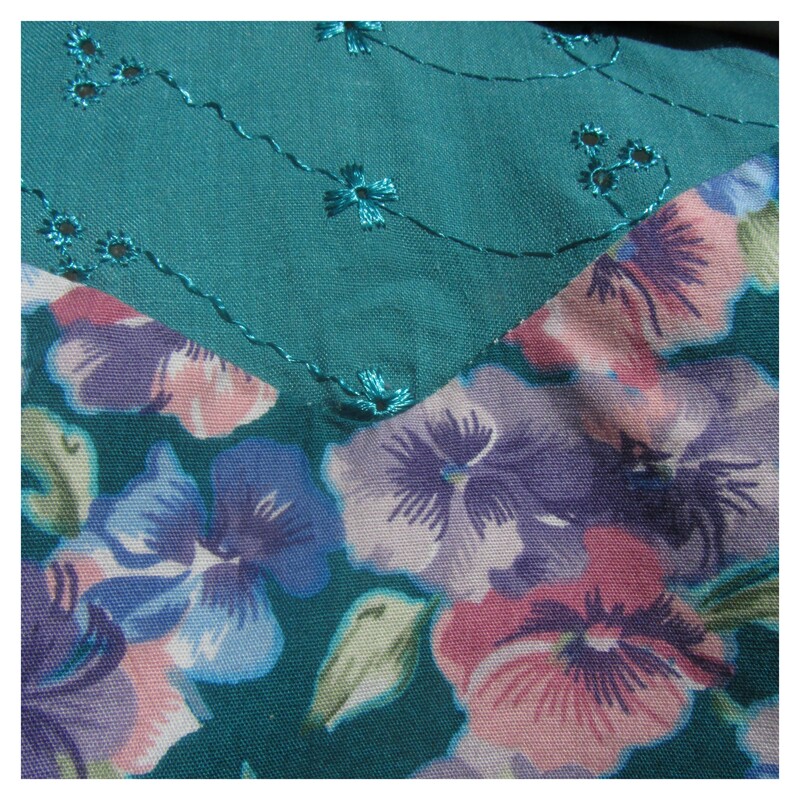 But with my pattern mistrust, I decided to use some cheap fabric first: a floral polycotton on sale at my sort-of-local fabric shop (Trago Mills near Liskeard), and a polycotton broderie anglais from my local fabric shop (The Remnant House in Bude), both at about £2.50/m. I didn’t make a muslin, which was probably was my first mistake. I did however add 2 inches to the bodice along the lengthen/shorten line because of my height. I swear I measured properly and chose the right size for the rest of my measurements, but after sewing the darts and one bodice side seam, it was obvious it was ridiculously big and no pinning (admittedly I gave up pretty quickly) fixed it, so it got thrown in the corner for a few weeks. After reshaping and increasing the width and length of the front darts, and increasing the seam allowance at the top of the side seams, I figured it was acceptable enough and finished the bodice, and added a waistband and gathered rectangle skirt instead of the pattern’s skirt (due to lack of fabric and because I was being lazy). The zipper went in without any hassle, and was pretty well hidden, except that since the dress has been washed one side of the lap has decided to flip the wrong way just above the waistband. I could get the iron out. But I won’t. And then, once it was all finished, somehow the combination of not taking enough time over fitting and losing a few pounds has meant that it’s got quite a lot of excess space at the bust, and a little at the waist, although that comes in handy for those big lunches and sneaky summer ciders. So, when I remake Ava, which will be happening in the near future, I think I’ll be going down a size, however this dress is still my most worn item at the moment, so it’s a win in my book.